Who is Exhibiting at the PASS Summit 2018? Enterprise Data & Analytics, That’s Who! 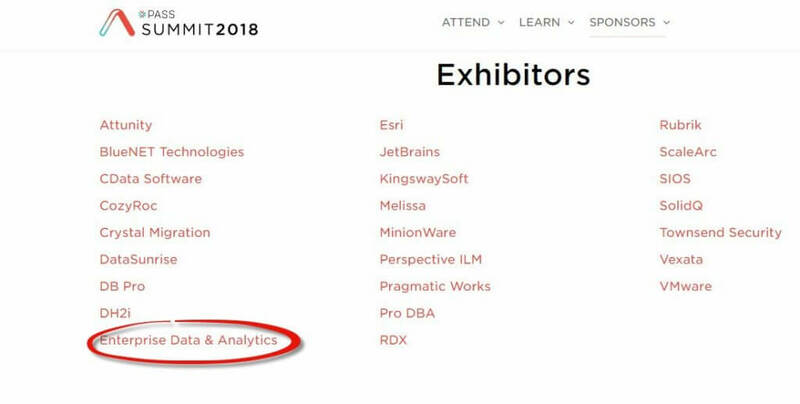 I am honored and excited to announce that Enterprise Data & Analytics will be an exhibitor at the PASS Summit 2018! Honored and excited – that’s me! A person discovers the Community and is overwhelmed at our openness and genuine willingness to help others. They realize they are not alone. They learn more and become better at their jobs which, in turn, positively impacts their quality of life. Some desire to give back to the community, so they develop a presentation and submit it to a User Group or SQL Saturday. Some are selected to deliver their presentation. Some presentations are well-received and increase the visibility of the presenter in the community. As presentations are honed over time, some are used as a springboard to develop and deliver other presentations, further increasing the visibility of the presenter. Some presenters achieve enough visibility to become a brand. Some presenters are selected to present at larger events, like the PASS Summit. Some presenters use their newfound greater visibility and brand awareness to join a consultancy practice or to become independent consultants. The continued care and feeding of the brand of some consultants drives business growth. The businesses of some consultants grows to the point where they can become sponsors and exhibitors at events such as User Groups, SQL Saturdays, and – eventually – the PASS Summit. This cycle can be broken (or quashed) at any point by any number of actions, inactions, missteps, mistakes, and/or competitive overreach. In fact, I promise you will make mistakes and take missteps along the way (ask me how I know), but those mistakes and failures can tear you down or build you into more than you were – and the outcome is 100% your choice. I advocate for the next generation of presenters. I want to see you engage, learn, share, grow, build their brands, and give back – just like I did. PS – Need some help with your data? Contact us! We are here to help and by hiring Enterprise Data & Analytics you support some great communities!